Indian chicken curry - grilled chicken simmered in a creamy yogurt sauce. Tikka Masala, Jeera Rice, Naan is one of the most loved combinations at our place. These delicacies are perfect for a special Sunday brunch or for entertaining guests as well. In a big bowl, add lemon juice, turmeric, cayenne pepper and salt. Mix all the ingredients well. Add the chicken to the bowl. Coat the chicken well with the marinade. Cover with a plastic wrap and let it rest for an hour or so. You can use chicken drumsticks as well. Finely chop onions and cilantro leaves. Puree tomatoes, ginger, garlic and red chillies to a fine paste. Avoid adding water. You can use store bought canned Tomato Paste instead of tomatoes. I have used mild Byadagi red chillies which impart a nice colour. You can use Kashmiri Lal Mirch powder or Spanish Paprika for colour as well. Heat a pan or a griddle for frying chicken. Add 1 tbsp butter, 1 tbsp oil and coat the pan well. You can skip butter, but frying in butter gives a nice brown colour. Pan must be hot enough, so that chicken makes a sizzling sound. Place the marinated chicken on the hot pan. 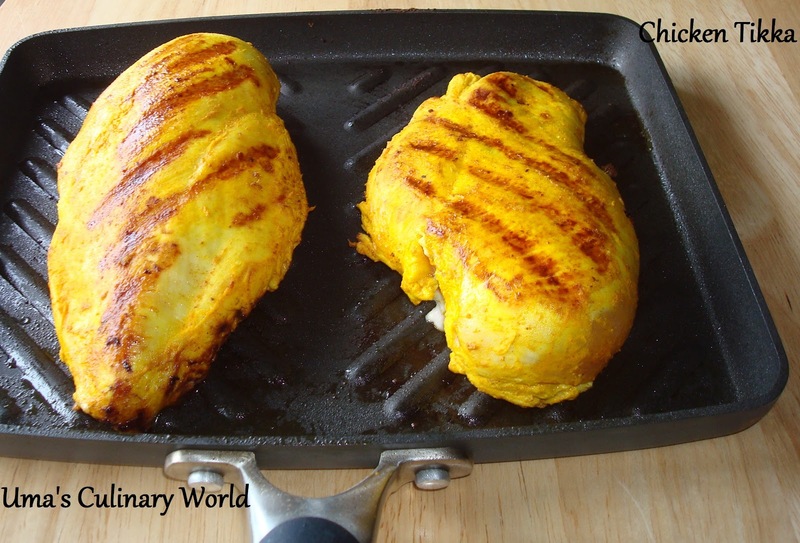 Cook each side at high heat for 2 - 3 minutes or until brown grill marks are seen on the chicken. Let the half cooked chicken cool for about 10 minutes. Dice it into bite size pieces. Alternatively, you can broil the chicken in an oven as well. Beat the yogurt well with a whisk or a spoon and keep it aside. Heat a kadhai/wok and add 1 tbsp butter, 1 tbsp oil. Add onions and saute until onions soften. Add tomato puree and cook until it forms a thick paste. Add ground coriander, ground cumin, tandoori masala and garam masala. Saute for another minute or so and add chicken. Stir to mix all the ingredients well and continue cooking until chicken is completely cooked. Add little salt if required. Lastly, add yogurt and bring it to a boil. Yogurt will add a nice creaminess to the curry and balance the flavor of spices as well. A bright red sauce will change to an orange color. Add more or less yogurt to suit your taste. Garnish Chicken Tikka Masala with chopped cilantro and serve with raw red onions and lemon wedges. Enjoy with Roti, Naan, Parathe, Jeera Rice.